An abundance of Wildlife awaits those exploring the Highlands of Scotland. Consider living in Scotland? Like to buy that perfect Retreat? Osprey - (pandion haliaetus). 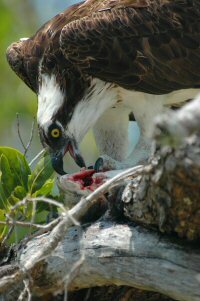 The osprey lives mainly on wooded islands or on the side of lakes.Feeding on fish from lakes and occasionally the coast. The osprey is one of uk’s largest birds of prey. The main places to see these beautiful birds are at public view nest sites like Loch Garten, Loch of the Lowes near Dunkeld, Speyside and Perth. The osprey migrates from Africa traveling thousands of miles in late March and April; to breed in Scotland leaving again in August and September. Fish are caught the Osprey diving into the water with their wings half-folded and feet thrown forward at the last moment. Ospreys generally dive to a maximum depth of 1m. The population of Osprey currently stands at around 200 pairs. The Osprey’s nest, called an eyrie, is usually built on the top of a large tree, a conifer. Although Ospreys have nested in deciduous trees , on cliff ledges, coastal rocks, buoys and electricity pylons. Ospreys share the nesting duties between the pair. The female does most of the work -incubating, brooding , guarding the nest, direct feeding of the young and will hunt later on when the chicks are larger. The male Osprey, spends all his time catching fish for himself, the female and the young. In case you hear an Ospreys call, it is a repeated, short, shrill whistle - 'tchip tchip tchip'. Copyright © The Scottish Highlands Website 2019. for Peak District Cottages and Peak District Accommodation in the Peak District .